Follow artist Bj. deCastro through the processes of creating some of her paintings. Starting a new piece called, Ranchita Arroyo Grande Morning. It will tell a story of one of the most serene places I have ever been to in my life. “The Making Of..” pics will follow soon. 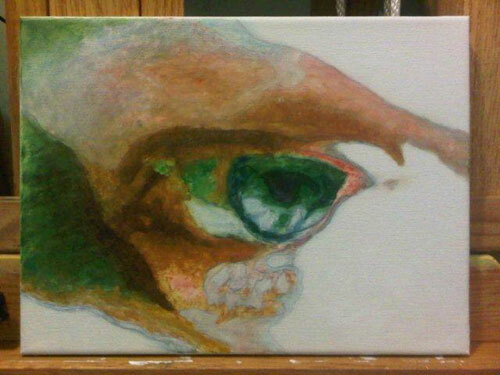 At this stage of the painting, I have over 20 hrs of work. I add my smaller detail brushes, sizes 0 and up, to my repertoire for the day and begin the details. Visuallly, the changes are minimal. Can you see the differences? I am now, for the first time, making a conscience effort to focus on abstract shapes that need correcting in shape and color. The smallest brush stroke can change the way an element looks in a painting, so this process will continue thorughout the rest of the painting’s completion. 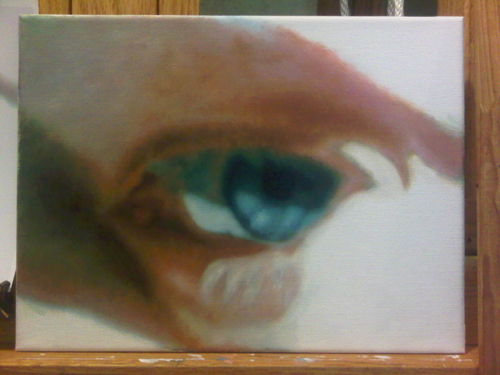 I set my larger brushes aside and move to smaller sized rounds for adding and blending the initial detail work. 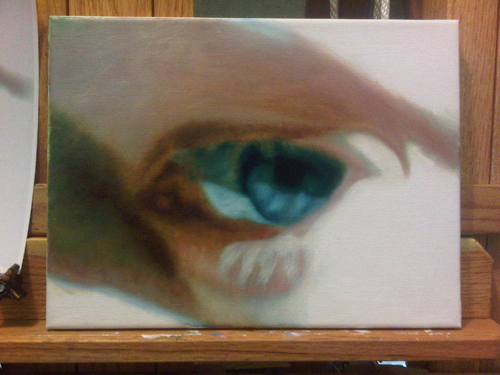 Changes are subtle as I move all around the canvas correcting color, shapes and values. 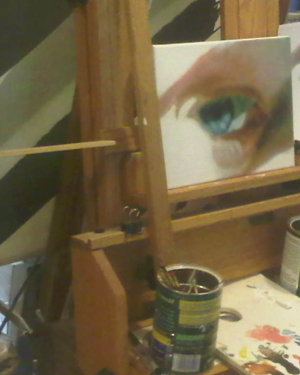 My easel is setup next to a closet with mirrored doors, so as I work I can view my progress in reverse. When artwork is viewed in a mirror, it tricks the eyes and helps you to see corrections you need to make throughout the creative process. Research and reference materials for my paintings come in different forms. I may take many photos of my subject (as many as 50) and use my camera as a sketch pad framing the perfect piece. I do thumbnail sketches and paintings; or I occasionally paint ‘en plein air’. Another trick I use, when painting away from the studio, is to take a picture of my work in progress and ‘flip’ the image in my phone, camera or laptop software. This serves up the same result as in this ‘mirror’ pic. While my dark contrasts are still wet, I like to move right into the midtone values. This allows me to move the oil paint around and blend more easily, so I can keep the structure of the different elements in check. 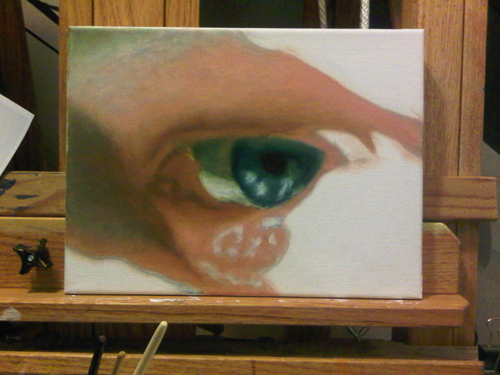 I am still using filbert brushes (as large as possible) for these initial stages of the painting process. 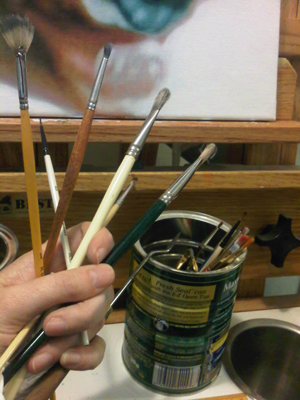 I am always anxious to pick up the smaller brushes to begin my favorite part of each painting… the details. But it is important that I restrain myself, while I am fine-tuning the blocks of values, colors and structure. I will let this layer cure to a firm enough surface to withstand the scrumbling and glazing that will come next. Next I start laying in the darkest values. The painting starts looking weird again at this stage due to the extremes. I am not concerned with detail yet and even the structure will be fine-tuned at a later point. Using a medium sized filbert brush on the flat side, I start laying in fill color. My goal here is to fill the entire canvas with the first layer of paint. This layer has less Turpenoid added in the paint mix to the consistancy of sour cream. In oil painting, you need to paint lean to fat. Meaning, thinner to thicker paint, so as the piece cures over time, there is no ‘cracking’ from the natural movement of the under coats as the gases escape. I paint similiar to my watercolor method with many layers of color to achieve a beautiful transparency. When natural light hits the completed painting, even the ‘clownish’ underpainting colors show through for a realistic vibrancy. There are many mediums out on the market to help the artist achieve this smooth buttery consistancy during the painting process, but since I paint in layers, I prefer the quick-drying properties of Turpenoid. This allows me to get back to the painting the next day. After I am done laying in the color in this step, I go back over the entire painting with the same filbert brush using the side of it to blend and work the paint into the tooth of the canvas for a smooth painting session next time. After the canvas is Gesso covered and dried. I begin by sketching right on the canvas with charcoal. 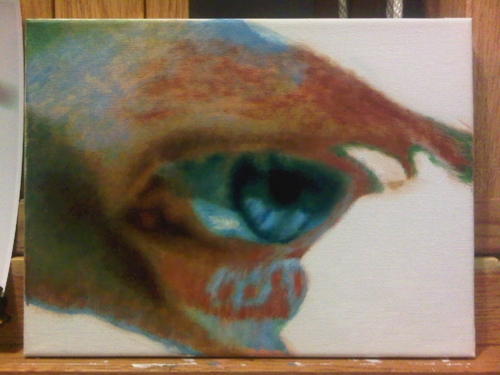 Next, I begin the underpainting process mixing the colors with Turpenoid to a ‘watercolor’ consistancy. The entire canvas is covered with this thin oily mix in base and complimentary colors. Some values are emphasized to keep balance between light and dark structure. When I have enough paint on the canvas as to make the initial charcoal sketch difficult to see, then I put my brushes down and let the painting cure for the next step.